I tried to rename the file extension, but it still doesn't work... 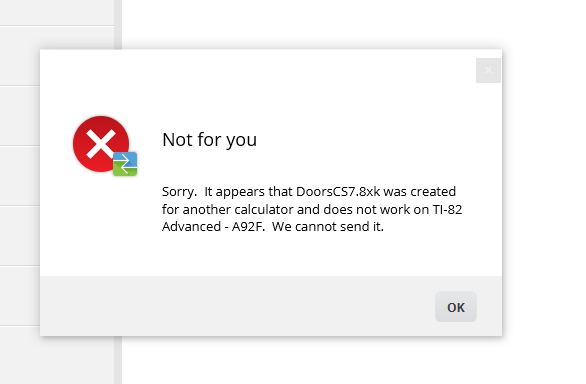 I read some people already use Doors CS on their TI-82 Advanced, so I do hope there's a way to run it on my friend's. You need the TI-83, not TI-83 Plus, version of Doors CS. Look in the "Other" folder (in the download from https://www.ticalc.org/archives/files/fileinfo/430/43068.html, for example). © Copyright 2000-2019 Cemetech & Christopher Mitchell :: Page Execution Time: 0.154060 seconds.